Last week, the liberal website Paste Magazine had to print an article in which it backtracked on claims that Marvel had backtracked on a plot point in Captain America: Steve Rogers because of social media pressure. Marvel hadn’t, there would have been no time to do so, Paste held their hands up. And there was backtracking squared. Will right-wing Breitbart do the same? In an article by Charlie Nash, and in response to the news that Riri Williams would be the new Iron Man – well one of them at least – the article had some complaints to make. We are just loyal, long-time readers who are sick of our favorite characters being butchered by nose-ringed lesbians for the sake of diversity, and at the apparent expense not just of dialogue, story and creativity but also, it now appears, the commercial success of Marvel’s comic books line. I have yet to see Brian Bendis – the man responsible for Riri Williams, Miles Morales and more – described as a nose-ringed lesbian before. Nor Jason Aaron, the man responsible for The Mighty Thor. Nor Nick Spencer, the writer of Captain America: Sam Wilson. A quick check and, sexuality aside, neither Kate Leth nor Marguerite Bennett appear to be sporting nose rings either. Not that there’s anything wrong with nose rings. And, before Marguerite, was Angela anyone’s favourite character? Also… Can’t anyone take a joke? They target Angela Queen Of Hell for its falling sales after its sales halved from launch to its final seventh issue. Without realising that’s pretty common for any comic book, even the successful ones. Indeed plenty drop to half their sales with the second issue. It’s common. Also plenty of books are launched and succeed or fail for all manner of reasons. We are losing the bash-em-up Contest Of Champions, but Moon Girl, and Squirrel Girl are surviving. It may also be worth pointing out that The Mighty Thor, female for a number of years now, has performed strongly sales wise. But that would defeat the point they are failing to make. Nevertheless they attack the announcement that Riri Williams will be the new Iron Man. Without any recognition that Jim Rhodes was a black male Iron Man in the past. That it looks like Victor Von Doom will be another Iron Man. And that this will be responsible for further falling sales. 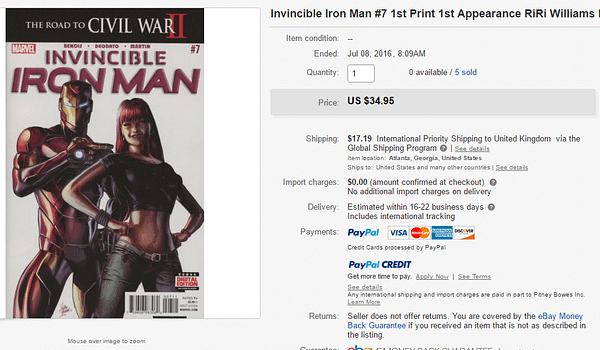 Sadly, Bleeding Cool pointed out that as a result of the announcement, all issues with her appearances in have suddenly sold out as retailers rush to order them, sending them all to second prints – third prints for her first appearance. Which has now sold copies for up to $35 on eBay. Hell, that guy just sold five for that. And I am expecting next week’s advance reorder charts to put Invincible Iron Man #12 near the top. Marvel has always been political. Captain America started fighting Hitler and the Nazis before the USA entered the War. Fantastic Four fought the Communists. Captain America fought, then resigned because of Nixon. The Invisible Girl became The Invisible Woman, you had a character actually called The Black Panther from a fictitious, idealised African country. And audiences have changed, just go to San Diego Comic Con, go to the Marvel panels, go to the Marvel booths and see the audiences. Marvel aren’t trying to change things, they are reflecting changes so they can make more money. It’s worth pointing out that while Marvel execs were concerned about the performance of superhero movies with female leads, they had no such problem with television shows, where they knew such shows could perform commercially. They’d already had everything from Charlie’s Angels to Buffy to prove the appeal. When Breitbart complains “This has effectively turned the company into a multi-billion dollar feminist zine publisher”, it’s the billion dollar thing that’s the clue. Whatever changes Marvel are making, they are making them to make money. And, as of June, it seems to be working rather well. Sales are up, up, up. Primarily for DC but also for Marvel. When they complain “race-baiters and gender warriors who complain endlessly about the “lack of diversity” in comic books don’t buy comic books” one must ask who bought all those comics last month. And, as the reference to Spider-Gwen Annual shows, Charlie Nash doesn’t seem to be buying the comics he’s talking about either. But the biggest error is when Breitbart states “People read comic books to escape the real world” without realising that Marvel has always tried to reflect the real world. Sure, there’s escapism, but Marvel set their superheroes not in Metropolis or Gotham but in New York – Queens, Westchester, Manhattan, wherever. And have always strived to reflect what the hell is going on. The changes that Breitbart complains about, are just further examples of what Marvel has always done – or at least tried to do, with varying degrees of success. And it seems, right now, they are succeeding. It’s #SmallPressDay Vs #DoctorWhoComicsDay – Who’ll Win?